When I am rocking and rolling on ARs drills, it can easily cost me $20-$30 an hour in ammo. That is money well spent from a practice perspective, however there is a far less expensive option for about 90% of your training at 0-50 yards. If you have read any of my articles you most certainly know I am a major proponent of .22LR analog based training. 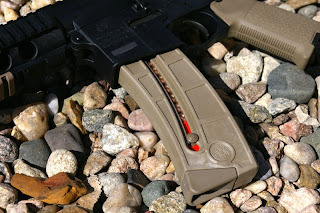 Shooting your .45, 9mm or .40 or in this case .223 or 5.56 chambered AR can get expensive really really fast... so fast in fact that you could pay for the this reviewed Magpul MOE equiped S&W M&P 15-22 in as little as 2000 rounds. This S&W M&P 15-22 review should probably be termed long-term because I have been shooting this rifle for a little over four months now with easily over 5000 rounds through it. During that time, the rifle has been flogged and abused as a training and drill rifle. That abuse includes being continuously banged about while hanging from a single point sling with the flash hider often getting jammed into the range’s gravel as I transition from rifle to pistol. The point being, the rifle has not been treated lightly and it still works perfectly. The most significant advantage of the S&W M&P 15-22 is that it is the only .22LR AR which functions perfectly as a training analog for reloads/mag changes. The fit and feel is really quite good for a first generation gun made almost entirely from polymer. I am sure S&W will make refinements along the way, however I have been pleasantly surprised that the S&W M&P 15-22 has remained solid despite the abuse I have feed it. As with any great training analog, the closer you can match the fit and feel of your real AR15 to the analog, the better. 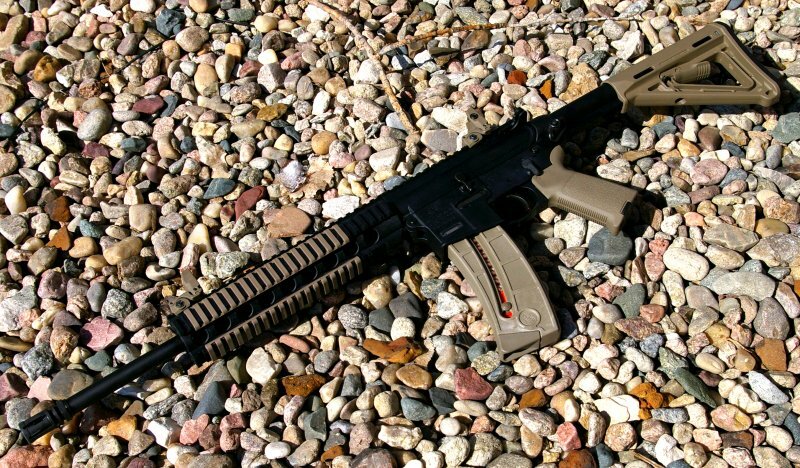 In my case, I have a lot of Magpul MOE furniture on my ARs, so it made sense for me to choose the MOE version of the S&W M&P 15-22 which comes complete with MOE grip, buttstock and picatinny covers. The result is that my hands and fingers are building muscle memory and over the last couple months, I have definitely become faster with my centerfire AR15s. One of the features of the polymer construction is that the AR is a very light 5.5lbs or about 1-2lbs lighter than a standard AR, depending on the configuration. This is easily fixed by adding stick-on lead hobby weights inside the handguard and adding weight inside the hollow buffer tube compartment for those that want to match the weight and balance of the S&W M&P 15-22 to their AR15. The light weight for me makes me slow down a bit and focus on stabilizing a sight picture before the shot, plus it is a whole lot less fatiguing to shoot for 4-5 hours straight. 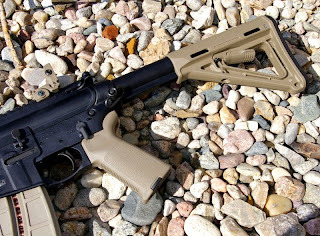 The S&W M&P 15-22 is available in many different variations, however I chose the Magpul equipped MOE version which includes a set of Magpul Flip-up sights. 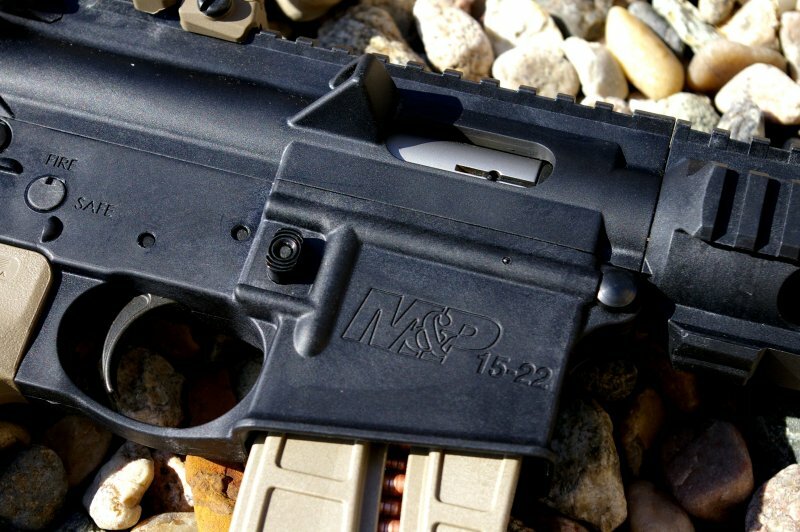 Nearly the entire S&W M&P 15-22 rifle is made from S&W’s high strength polymer which I have found to be very durable. 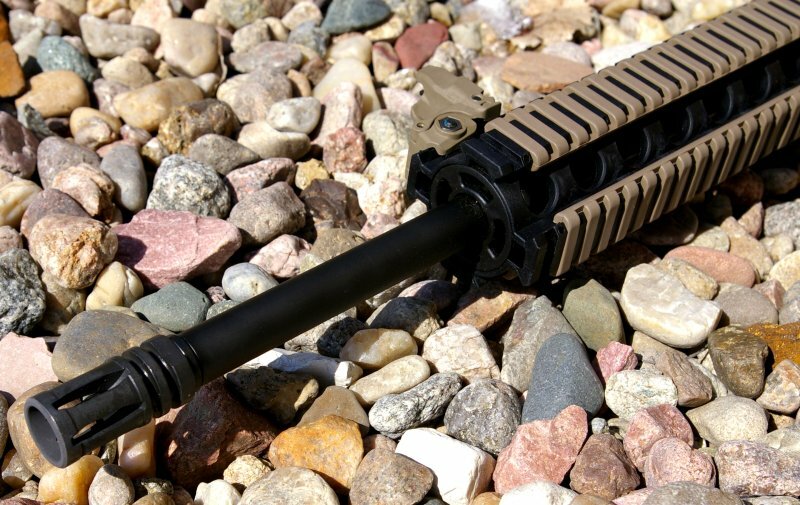 The uppers and lowers are not compatible with a standard Mil-Spec upper or lower AR receivers and are designed around S&W’s own proprietary magazine, bolt, bolt catch, barrel, functioning charging handle, and forend. The parts which are readily interchangeable with any Mil-Spec AR part are the grip, 6-position buttstock, and trigger assembly. 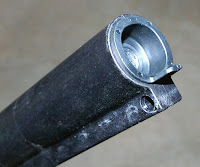 The capped hollow buffer tube is access by removing the buttstock and can be filled with all sorts of items and could be quite handy as a survival items storage. This is not an Atchisson style AR conversion. S&W has designed their own proprietary .22LR AR flavor from the ground up. 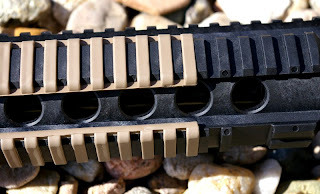 The bad news is any Black Dog, or Umarex style mags you might have will not work with this conversion. 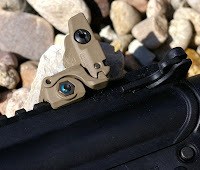 Other features include a functional bolt catch, two-position safety selector, case deflector, single point QD-sling mounts on left and right, and a recessed mag release. Most .22LR ARs provide 95% functional operability of a standard AR, however as noted above the S&W M&P 15-22 is the only 22LR AR which maintains 100% functional operation as a training analog even for reloads/mag changes. All other .22 ARs and almost all AR .22 conversion kits do not lock the bolt back with the bolt latch, but instead are held back by a follower in the magazine. Pull the magazine on those ARs and the bolt closes. Loading at that point requires a wonky manual of arms which necessitates the charging handle be pulled back. On the S&W M&P 15-22 a standard manual of arms reload is maintained; last shot bolt holds open, drop the mag, insert new mag, and hit the bolt release with the thumb. If you want to train for reloads then the S&W currently is the only AR option. Thousands of rounds later, I have only had a couple random errors which were definitely the fault of the very inexpensive bulk boxes of Federal 525 and Winchester 333 ammo or a lack of cleaning/lubrication as rounds started to add up. Generally I do not have any issues over a 500 round shooting session, however above that a squirt of lube assures there are no issues from the gunk. If the reliable 10/22 had a brother in the AR world this S&W M&P 15-22 would be it. I will state that this has been without a doubt one of the most reliable .22LR semi-autos I have owned, especially considering, it is routinely feed the cheapest stuff I can find on the shelves and rarely sees what I would term as “quality” .22 ammo. I will note the feed lips do start to wear on a magazine after around 3000 rounds however it still feeds just fine. 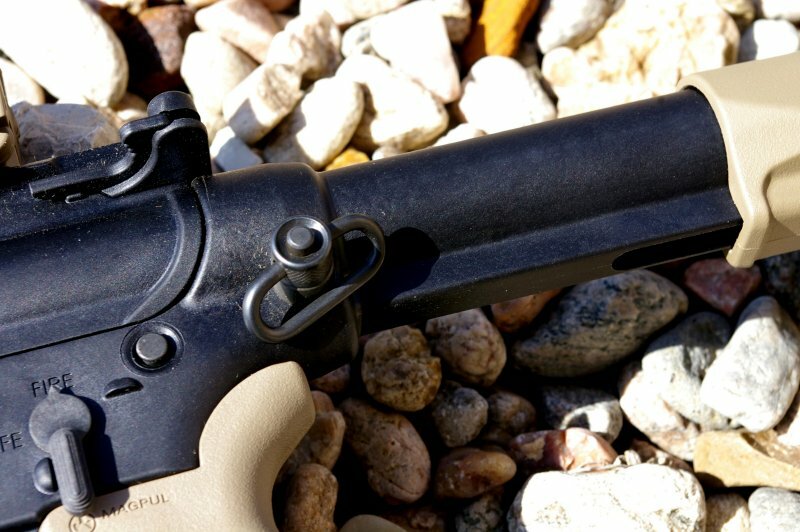 S&W notes on their site that the S&W M&P15-22 includes a match grade barrel which I would say is both optimistic and misleading. If it is, S&W must have different standards than I for “Match Grade”. S&W now owns Thompson Center who was rumored to make the barrels. I own a Thompson Center Contender with a .22LR match barrel. The chamber is so perfect it only will chamber quality ammo and I can shoot dime sized 10-shot groups all day long at 50 yards and .25” groups if I want to be picky... and that is from a pistol. Regardless of ammo, my best group with the M&P15-22 was .75” at 25 yards with most groups in the 1”-1.25” range. This accuracy is not particularly spectacular and far from what I would call Match Grade but perfectly acceptable for training purposes, hunting and plinking. Currently no aftermarket match barrel suppliers are offering a replacement barrel at this point however once some start to trickle out, you will really be able to take advantage of the very good S&W M&P 15-22's tweaked AR trigger. On the other hand, it is good S&W did not make this a tack driving .22 with a tight match chamber because reliability would certainly suffer. Would you rather have a training AR or a tack driver that can only chew on high end match spec ammo? Given the intent of the rifle, S&W made the right decision... of course if I picked up a second S&W M&P15-22, I would need to up the accuracy. Accuracy noted, I would buy the S&W M&P15-22 again in a heartbeat, I would recommend it to friends, give them as gifts, and would even buy a second, because this is a training tool and not a precision .22 Sportsmen’s Challenge gun, but most importantly it is a blast to shoot. As long as I can continue to regularly spin the 3”, 1.5”, and 1” steel spinners at 25 yards off hand, I am a happy S&W M&P15-22 carbine owner. 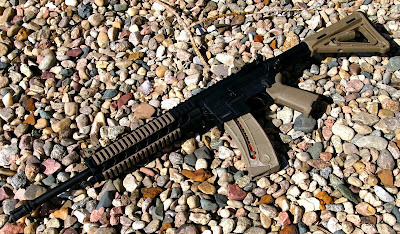 From a common sense preparedness perspective this is the best .22AR trainer you can own, and gets those unfamiliar with ARs up to speed quick and cheap. It is also more than accurate enough for small game hunting and with the hollow buffer tube and lightweight feel it would also be a decent little survival rifle. The S&W M&P15-22 also appears from a distance as an AR which when all the .223 ammo is gone and you are left with only .22LR rounds, this .22 may still provide the same visual deterrent as a full sized AR. What the S&W M&P15-22 has going for it is plenty; it's a blast shoot, cheap to shoot and has been the perfect AR training analog for me to fully practice point blank to 50 yard shots with the same exact sight offset points of aim as my AR15. From every aspect the S&W M&P15-22 provides the shooter with the experience and training of AR shooting at a substantial ammo cost savings. If you own an AR, you need one of these to train with regularly and below is the justification you need. All three of my .22 caliber AR rifles have paid for themselves in very short order. In previous .22LR AR and .22 training analog reviews, I shared this same math for justifying the purchase of a rimfire AR for training. The least expensive reliable .223 ammo I can find for training and plinking is $5.99 a box of 20 or calculating it out $14.98 per 50 rounds. For .22LR plinking ammo I usually reach for something like the Federal 325 count box for $13.99 which comes out to $2.15 per 50. Comparing .223 to .22, that is a $12.83 difference per 50 rounds. On a rimfire AR15 such as the $500 street priced S&W M&P 15-22, it only takes 39 boxes of 50 .22LR or 1950 rounds and the gun paid for itself. I am not sure about you, but 2000 rounds of .22 ammo goes quick over just two range days for me. At that point, using the .22 rimfire AR is saving you a bundle when training. Just make sure your 25M zero is the same on both your 5.56 AR and your .22LR AR. I use and recommend this printable 25M AR zeroing target from BobdBob.com http://www.bobdbob.com/~deneb/doc/targets/m16a2-25m-zero.pdf for all my AR and .22 Zeroing which is simply the best target I have found for that purpose.